COMMAND THE DARK: The sun never sets on a vehicle equipped with Rough Country's sleek 20-inch Black-Series LED Light Bar. With a powerful 9,600 Lumen 120 Watt output, this LED light is a sight to behold. The black panel design offers jaw-dropping good looks that blend perfectly with any vehicle using black accents like grilles, wheels, bull bars or steps! These all-weather lights feature a durable, die-cast aluminum housing and include a premium, waterproof, flat-wound, braided wiring harness with toggle switch and in-line fuse. 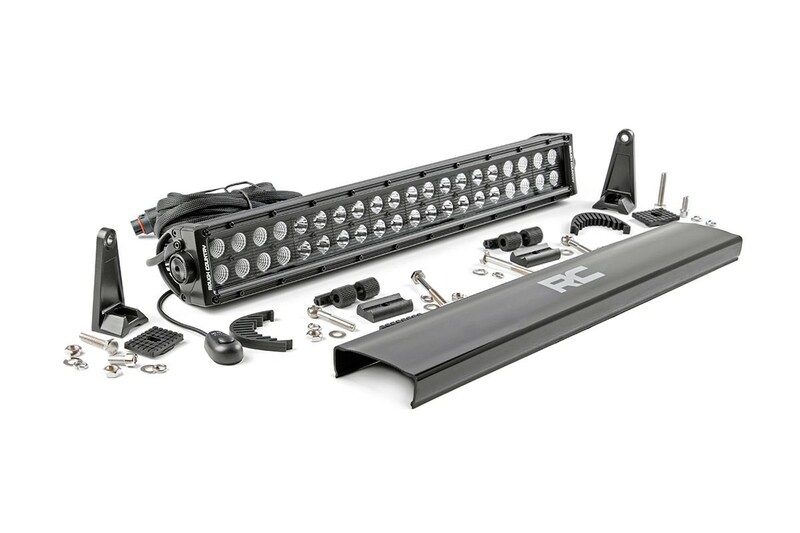 This product includes Rough Countryâ€™s Light Bar Noise Silencers to quickly eliminate hum, whistle, and other wind noises associated with mounted LED Light bars. These handy Noise Silencers snap over the cooling fins firmly, preventing any noise-generating vibrations and ensuring a snug fit that stays in place. Includes a snap-on cover and Rough Countryâ€™s 3-year Warranty.